If you are a food blogger, or want to be one, you probably have the cooking part down. But how are your food photography skills? One of the easiest ways to attract people to your recipes (and your blog) is to take appealing and appetizing photos. Your eyes are the window to your soul but they are also the window to your stomach. Yes, this is easier said than done. I am still learning too. But luckily for you (and me) there are A LOT of resources out there for us food bloggers. 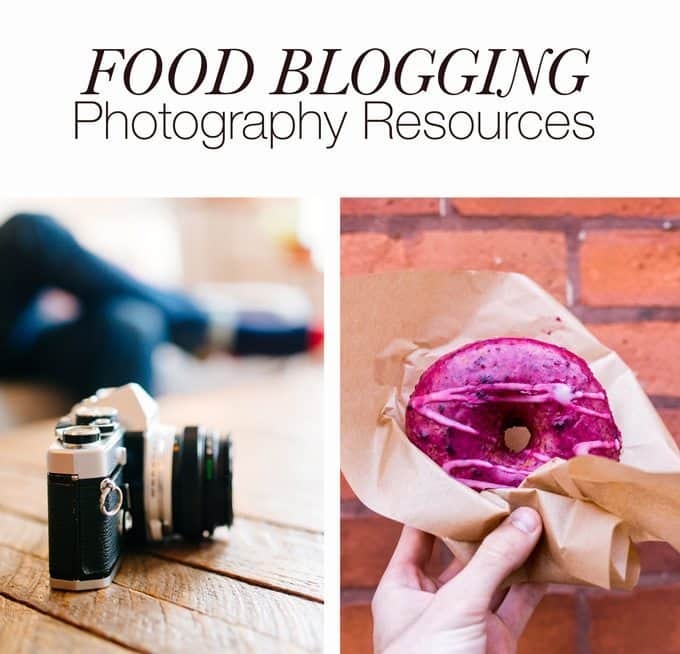 Use these food blogging photography resources to help you take your blog to the next level! This post contains some affiliate links – if you click on the links, I may receive a small amount of money which I will use to help me run this blog. Thank you in advance for helping out small businesses like mine. My newest favorite food photography book is by Nagi of RecipeTin. 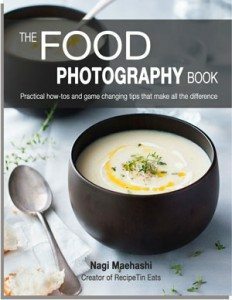 The Food Photography Book is worth every single penny – her trick on finding the light is food photography gold. Add to that advice on artificial lighting setup and you will be able to step up your game. Pinch of Yum, another great food blog, has an awesome book called Tasty Food Photography. Learn the technical aspect of your camera, lighting tips, information on composition, props and setup. Even editing and general workflow suggestions. Tasty Food Photography was the first resource I used to help me better my photography. Lindsay inspires me to be a better photographer with every post she publishes on Pinch of Yum. If you have basic photography down, take your photography to the next level with Food Photography Behind the Scenes – Bright Food, Dark Shadows. Nicole Brennan of the blog Spice Train wrote the perfect book to help you achieve the dark and moody food photos that are so very popular right now. Check your local park districts and colleges/universities and take a beginner’s photography class. Learning about your camera and learning how to shoot in manual mode really makes a difference when it comes to taking good food pictures. Many of these require a DSLR camera but more and more classes include information on shooting with a camera phone. Find your local photography school. I taught myself how to use my camera and decided maybe I should take a class just in case I missed a thing or two. I recently took a basic DSLR class at a local photography school and it was mind blowing. I learned 3 tricks for taking photography and was able to ask the instructor about some small questions that have been nagging at me. CreativeLive is my new (and favorite) go-to for online photography classes. I highly recommend Story on a Plate: Food Photography & Styling with Todd Porter and Diane Cu. If you can’t make it to one of their in-person 2-day workshops, this is your best bet. Food Photography for Instagram with Penny De Los Santos is fantastic if you are focusing on your Instagram photography. If you are still using a point and shoot camera, or your camera phone, it might be time to upgrade. I bought a Used Digital SLR Camera from Amazon as my starter camera and it is what I’ve used for most of my photographs. It’s an older model but works very well. And, it was a quarter of the price of a brand new camera. Score. shutter release – I can shoot photos in darker settings now and do less work in Photoshop after. As soon as I can save up enough money, I will be upgrading to this 100mm micro lens. It’s important to figure out your own photography style but this could take awhile as you get comfortable behind the camera. Styling and composition are two aspects of food photography that I still struggle with. I started a Pinterest board to keep tabs on the food photos and photographers that I like. Check out my food photography board here.